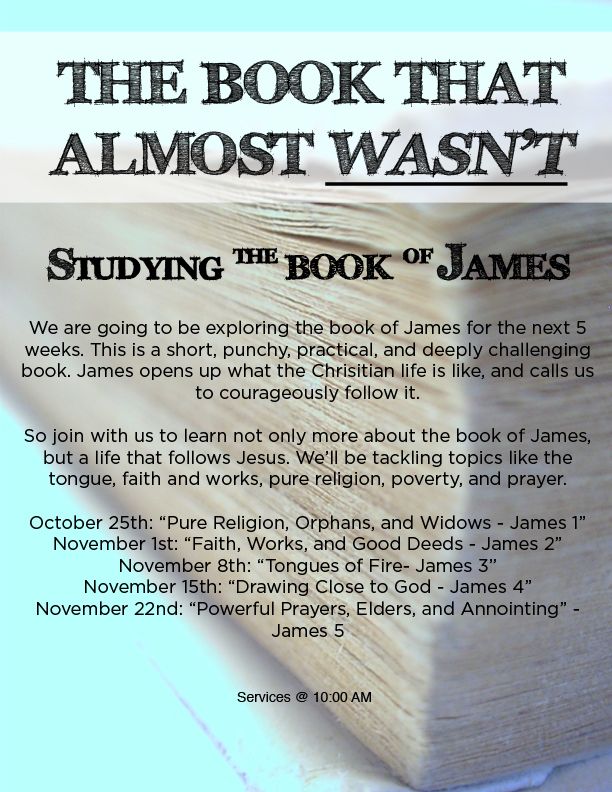 On Sunday we are launching a new series looking at the book of James. I would just say this, that this is a book that is really neglected. People say it’s not “theological” enough, not like some of Paul’s writings. Others say it’s too disjointed with little bits of wisdom and challenge sprinkled everywhere. I say though that it’s needed. James is punchy, straightforward, and challenging. James is theological because he refuses to let us share our beliefs, but instead calls out our actions. James is unashamedly Jesus orientated reiterating teaching of Jesus, most often found in Matthew. James is someone our society needs because we are infatuated with beliefs, ideas, theories, and debates. James wants us to care for the poor. James wants us to control our tongues. James wants us to pray. While we are busy debating, James was busy doing – and we need this reminder. So come Sunday that’s what we are doing, launching into this important, neglected, and almost forgotten book. Hope you can join us.